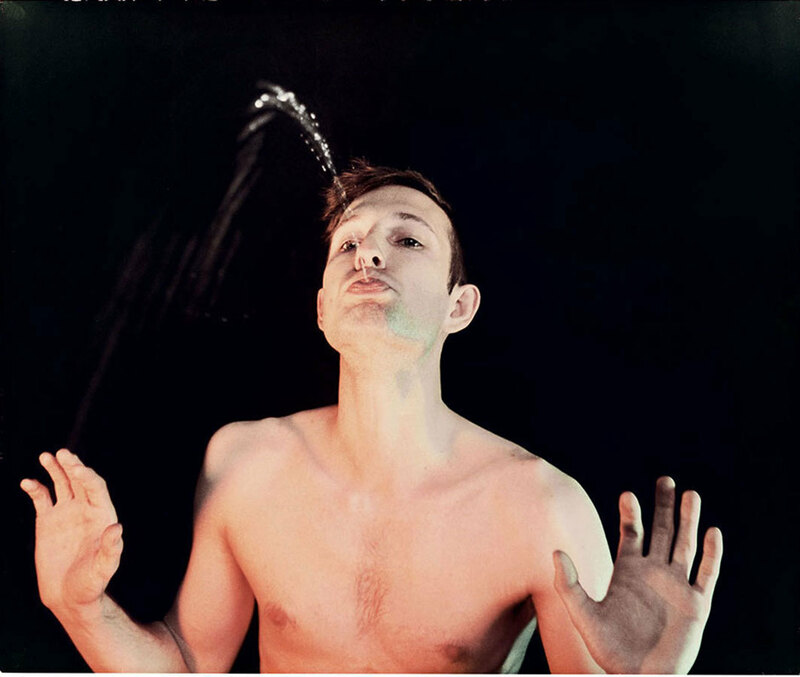 Bruce Nauman, Self-Portrait as a Fountain, 1966, C-print, 19 1⁄2 × 23 1⁄4". © Bruce Nauman/Artists Rights Society (ARS), New York. MODERNISM was a continual reconfiguration of vision. Picasso and Braque fashioned representations of simultaneous perspective with Synthetic Cubism; Seurat embarked on a new method of painting that emphasized the viewer’s perception of form and color; Courbet took high-society painting and transmuted it for the middle class. Bruce Nauman pushed these ideas further, using the body and the negative space surrounding it as modernist objects, the materials that could be monitored, examined, and exercised, anticipating the self-measurement of social media. His Clown Torture, 1987, is a sharp precursor to viral internet challenges and reality television. Clowns engage in various humiliating, repetitive scenariosshitting and reading on the toilet, having a panic attack, obsessively reciting a nursery rhymeall for our entertainment, just like the ratchet visuals that we now stream everywhere to feel better about ourselves. Influenced by gestalt therapy and phenomenology, Nauman began his work in the 1960sthe time that Donald Trump seems to identify as the start of America’s decline and the height of the civil rights era. Black people in America were mobilizing to demonstrate their political agency. Much of the conversation centered on their right to occupy mundane public spacesrestrooms, schools, restaurantswithout violent repercussions. This appeal for universal access penetrated the zeitgeist, and it continues today; equal access is still not secure, especially for transgender and queer people. Nauman’s work can be understood within this context as an interrogation of the banality of his white male body: its scale, identity, and relationship to his environs. Recall that his Self-Portrait as a Fountain, 1966, arrived just two years after the United States’ official desegregation of water fountains, which were never just innocent and deracinated modern objects. 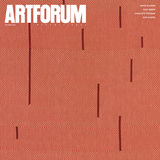 The self-portrait was, of course, a remake of Marcel Duchamp’s readymade Fountain, 1917. Nauman’s intentions were rather tongue-in-cheek and nodded toward history; however, he knew his body was a font loaded with a metonymic chain muddy enough to merge the darkest of political concepts with the lightest of objective explorationshis body as sculpture. Nauman's work can be understood as an interrogation of the banality of his white male body: its scale, identity, and relationship to his environs. Nauman is also our premier artist of surveillance. The viewer as variable is particularly important to his Corridor Installation (Nick Wilder Installation), 1970, a construction of several parallel narrow passageways monitored by a camera whose output to video monitors is delayed. The viewer who walks down each passageway is psychologically stunted. He expects to see his own present body displayed on the feed but instead witnesses different outputsone of the empty corridor, one of himself from behind, and one of the live feed. Appearing on-screen as if seen by others at different times, the viewer feels unable to control his own image. Self-representation becomes less a narcissistic act than the employment of a medium producing paranoia, stress, and claustrophobia. One of Nauman’s most compelling works to date is Contrapposto Studies, i through vii, 2015–16. Its impact relies on the seriality of the artist’s investigations of the sculptural pose. In his 1968 Walk with Contrapposto, Nauman, an athletic, attractive, and confident white male, struts through yet another narrow corridor. In the more recent version, he appears self-conscious, his body graphically sliced, analyzed, succumbing to gravity and illness. In the top half of the segmented video images, the color is inverted; the bottom half is the images’ mirror. He walks on his own head. It is a gorgeous paean to whiteness, worn and worn out. The balance has shifted. Jacolby Satterwhite is an artist based in New York.